Soak the Chickpeas overnight in salted water. Drain, rinse and blend until they resemble sawdust. Mix the herbs with the oil in a pestle and mortar or spice blender then mix the green mixture into the chickpeas. Season well and add enough flour that the mixture will form into balls and hold together. 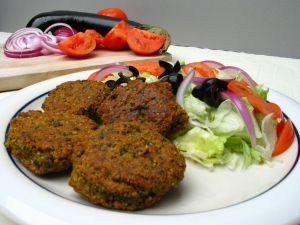 Heat up some sunflower oil and cook the falafel in small batches – turning them gently so that they brown on all sides. Drain them on kitchen paper and you can sprinkle with a little salt if you wish. Delicious served in a pitta with salad and natural yoghurt.